With patio season right around the corner, its time for outdoor parties and relaxed dinners! Whether you are celebrating Cinco de Mayo or just a fun summer get-together under the sun, whip up something delicious to serve to your guests! 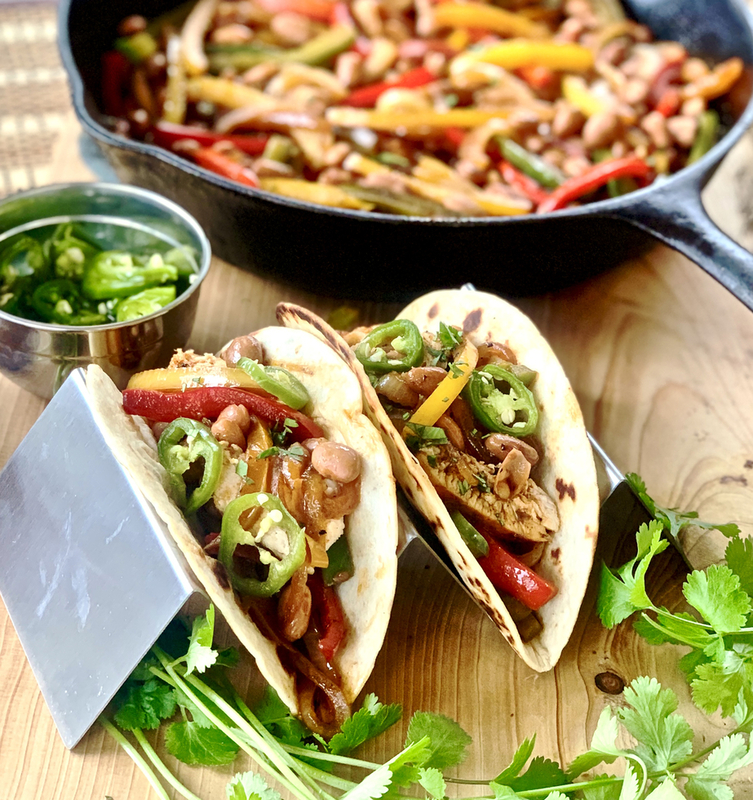 This easy, one pan fajita chicken tacos recipe that is easy to double (or triple) to keep the party going and your hands free to hold a drink or a stick for the piñata! If you’re already using the grill, feel free to cook the chicken that way to make it even quicker. Besides, why wouldn’t you want to spend as much time outside as possible and not cooped up in the kitchen? We did a quick marinade for chicken to give it extra flavor and tenderness that we are sure you will love! You can also cook your veggies in a skillet or pan on your grill to save trips in and out of the house. That way, you won’t miss a minute of the party! 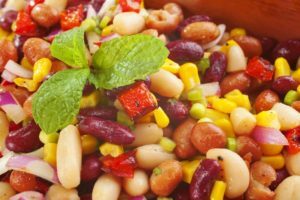 Randall Beans Pinto Beans are a great addition to the fajita style taco for an extra protein boost, creamy flavor and filler to make a little go a long way. 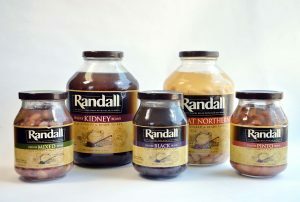 This is a good recipe to use our Randall Beans black beans in too since they are a great pairing in Mexican cuisine as well. A little spicy and big on flavor, this recipe will make everyone happy and is easy to set up with a toppings bar so everyone can have their tacos their way! But the cilantro crema may be all you need to finish these yummy chicken tacos off! Combine whole chicken breasts and marinade in a ziplock bag and massage to mix and coat chicken evenly. Lay bag flat in fridge for 30 minutes. You can do this step a few hours ahead of time to impart deeper flavor. Remove chicken from marinade and allow chicken breasts to come to room temperature. Discard the remaining marinade. Place on grill or pan over medium high heat, turning, and cook until chicken is browned and cooked through. Set aside to rest. Wash and trim produce, cutting onions and peppers into thin julienne cuts. Trim stems off cilantro and finely chop. Thinly slice jalapeños if desired. Add Randall Pinto Beans, fajita seasoning, and the juice of two limes (instead of the water called for with the seasoning packet). Stir to combine. Thinly slice rested chicken breast and add to fajita mixture. Bring all ingredients to low heat setting and cover. Heat tortillas before serving. Some folks prefer to just warm them up, but if you place them in the oven on the rack in a single layer on 400 degrees for 2-3 minutes, they will puff up and get a little crispy on the outside! Mix half the cilantro, sour cream, and remaining juice of one lime for the crema topping. Serve garnished with remaining cilantro, jalapeno slices, and lime wedges! Want more delicious Mexican recipes? Grab a copy of our Fabulous Fiesta Foods cookbook for more tacos, enchiladas, dips and bean dishes for Taco Tuesday! 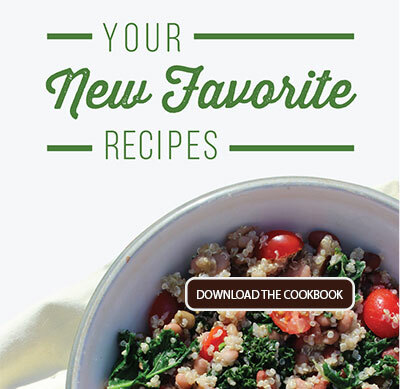 You can get your free copy here in time for Cinco de Mayo so you can celebrate in style! 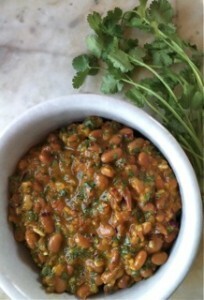 This legume recipe is great for Cinco de Mayo!